Cheap: Sometimes I’m as cheap, cheep, cheep as a chicken. Mindful: I like to think about how to live the best life most simply, enjoying life on earth without assuming it’s all here for me. You know; like using ALL the water and never sharing and buying whatever is cheapest without regard to how it got to me and where it’s going when I’m done with it. Which would be a good mascot for me and many of you, too. Mindful chickens. 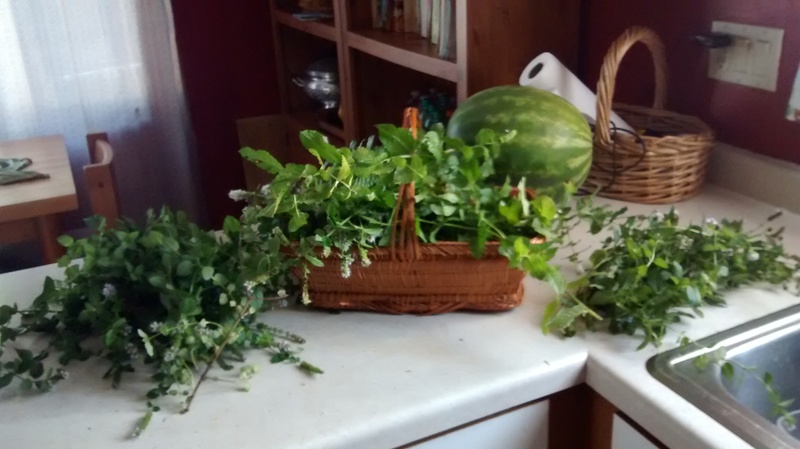 ONE: I harvested most of our current mint crop. This would be the strip of dirt between the sidewalk and house by our side door. My mint currently resides in mint condition (hah) on my kitchen counter. Sometime before this day is over I will pull the leaves off and loosely tuck them into plastic bags in our freezer. There are TWO seasons when you live with my Leonard. ‘Watermelon in the evening’ season will soon be over. That’s when ‘herbal tea in the evening’ season begins. Watermelon season is expensive; we easily eat two a week. We make up for it, I guess, by drinking homegrown mint tea the rest of the year. In case you care, this is an easy way to turn the mint in your garden now to tea on your coffee table when the blizzards rage. Grab a small handful (a quarter cup or less) of frozen mint leaves from the bag. Put the leaves in a French press coffee pot (I bought ours at thrift shop a decade ago for a kid who later decided they didn’t want it.) Pour boiling water over the leaves; let it steep a couple minutes. Or if you are us, go to the computer room, get lost in something, and wander back out to the kitchen an hour later to tepid tea. Drink it anyway. Whenever you finally get to the kitchen, press (with your pinky up in a French manner) the pot’s plunger … and Bob’s your uncle. Except, in our case, Bob’s our friend. TWO: I actually googled this last night: “How does one wash exterior windows on a tall house without a ladder?” Because, boy, does this house have a dirty windows. Did I mention we live a half block from a major freight train railway? We have the dust and grit. You can buy a Windex thingamabob that attaches to your garden house. It cost $9. This was the most fun I have EVER had washing windows, but don’t do it in your church clothes. I got SO wet when breezes would waft the spray back on me. It’s about 92% effective; which for old-fashioned windows that are too tall to reach safely, is effective enough. Too bad I can’t do it inside. I had fun. And I didn't pay other guys to have this fun, then charge ME! THREE: I got the window cleaning product at the hardware store. I walked there and back, which takes an hour. People were parking their cars and walking into a gym that is close to the hardware store. Hah, I got my exercise for free. The vitamin D was also free. FOUR: I didn’t take a shower before doing all of the above, thus keeping myself down to one shower today. FIVE: When buying groceries, as is usual, I bought mostly inexpensive ingredients. Except, sometimes I spend a LOT. Example: Last week I spend $7 for ONE pound of hamburger (for a giant pot of made-from scratch chili, some of which is in the freezer now for a days when I don’t want to cook.). SEVEN dollars for a pound of hamburger? This is frugal? Sometimes the chicken is mindful. Do you want meat from animals raised by ranchers and farmers? Or do you want meat produced by corporations? Most of the meat we buy in grocery stores (often at remarkably cheap prices), is raised quickly on foods not normal for that animal, with significant doses of antibiotics and growth-producing hormones. My three kids are grown-up, healthy, and on their own. I didn’t know in those years what I know now. I tried hard to feed them well as inexpensively as possible. It was not easy and it still isn’t. Many American families are living too tight to be able to make the choices I do now. This is one of the reasons Len and I DO make these choices. Somebody ought to keep on raising chickens that walk around eating bugs and seeds, cows that graze fields, pigs that wander, grunt, and eat slops and grain and acorns. If we make it impossible (by squeezing consumer prices too much), for people to be traditional farmers with their learned, honed, and passed along skills – where will we be as a nation if we lose that wealth of knowledge? I do not know how to keep a chicken alive, nor do I want to learn. I will pay $4/week for the eggs of healthy, contented, (Mindful!) chickens. When I buy those eggs, I figure Len and I help keep American strong. So if we only buy meat once a week, and it costs enough to make our eyebrows go up but the animal didn’t suffer and the farmer/rancher was able to make a living, and it was a healthy animal that won’t make me sick, either - then I am good with that choice. We always buy $7-8/gallon Organic Valley milk. Do you see how there are no ads from Organic Valley on my website? No one is paying me. I just want to point out that this company, while certainly not perfect, buys from hundreds of real farmers in California, Wisconsin, Pennsylvania, and New York State. Maybe some other places, too. I’m not their PR team. If you can make a choice, I’d suggest that as you can, try to buy some items that are from animals that are raised humanely by farmers in your area. As you can, buy from your local farmers markets and local produce stands. For those who steadfastly believe in giving a certain amount of money to their church or other organizations, maybe consider moving some of that donation to your grocery store budget? Why make Monsanto richer, when with ten dollars more per month, you can buys eggs from someone in your own county? I’m not in the mood to scold anyone. I am in the business of saying all that’s cheap is not, in the long run, frugal. By the way, I watched all these movies the first time; borrowed from the Racine library!